The first Toronto VS ALM User Group kick off meeting is being held on April 12th @6:30pm sign up at TALMUG to get the details and register. The User Group is for all roles within the Application Life Management team. Topics presented will vary from generic ALM practices to ALM with Visual Studio. If your involved in product management, a stakeholder, a business analysis or product owner, a developer or a tester this User Group is for you. Come out on April 12th and help us to kick-off this new user group code named TALMUG. If you are reading this blog you should check out bloggers, Susan Ibach and Jonathan Rozenblit. Microsoft developer evangelist who are the resident bloggers at Canadian Solution Developer. Susan and Jonathan are posting some very informative information on ALM, TFS, Visual Studio, testing, events coming, events happening now and in the past. The most recent blog is about LinkedIn with some great tips on setting up a professional profile. What not to do and what is important to do. Click the link below to see what they have to say. 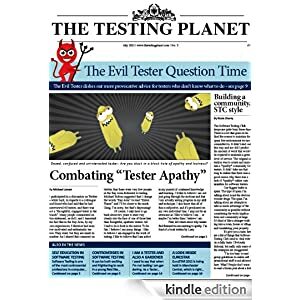 The Testing Planet is available on your Kindle. Think of me as the kid standing on the corner back in the 50’s with a newspaper held high yelling, “Read all about it”. I have downloaded my copy to my Kindle it cost 4.99US which these days is 4.99 Canadian. You can still download the PDF format or have home delivery should you not have a electronic reader yet. I’ll be reading from my Kindle on the train, on my deck (with a cold beer), anywhere I want. Congratulations to The Software Testing Club, Rob Lambert and Rosie Sherry. I am so excited, I absolutely love my Kindle for so many reasons. Did you know if the book your reading has text to speech you can plug your kindle into your car (need a USB plug) and listen while you drive. My brother-in-law and sister-in-law read a book on a recent road trip with their kindle. Next road trip we’ll be reading.